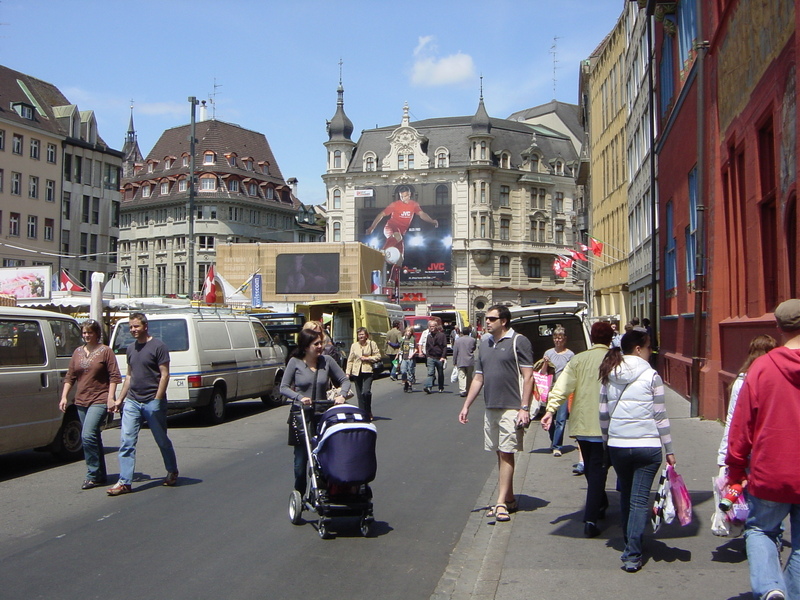 After such an amazing 2010 World Cup trip I had to do another European trip & with the European Soccer championships every 4 years falling 2 years after the World Cup I was ready for EURO 2008 hosted by Austria & Switzerland. For those that dont know, the EURO championships are like a smaller version of the World Cup, this time to see who is the best in Europe, which has a lot of the best teams in the world. So this time the sights would be different, there would be no USA games & my travel companions would be different. Travel Group: Joe “Joey McG” McGovern – played soccer at William & Mary with my buddy Dave Schifrin. Dave hooked Joe up with my Fram team when he moved to LA. So Joe has been playing when he’s not a China Doll…that means injured. We also connected in Germany 2 times for the World Cup. Ken who I met in Germany. 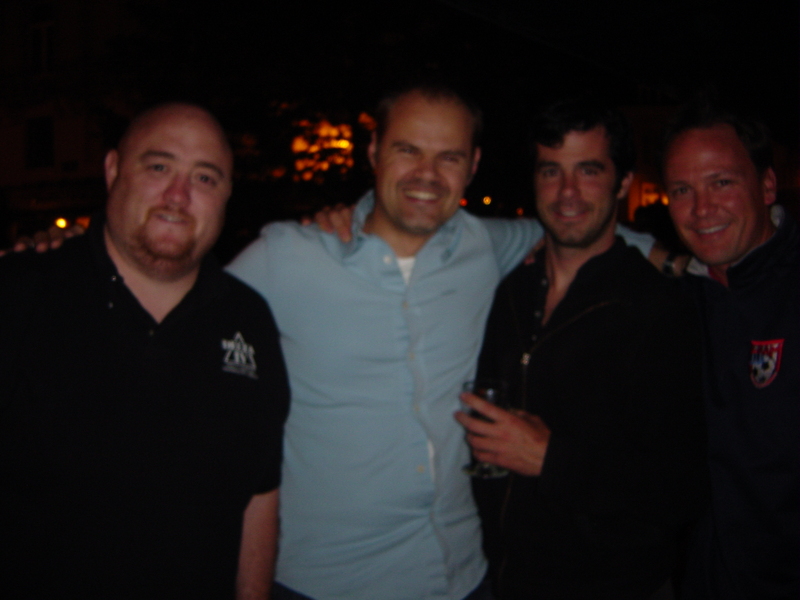 Richard Bendal, Ken’s buddy who lives in LA but Joe & I had never met before this trip…he is also one of the biggest guys alive as you will see in pics. Ken & I were the key organizers of the trip and we had a little framework to start with as he got game tickets for all of the Romania games…so this would be our team going forward. Romania got probably the best draw possible, for us at least, not them. Holland, France & Italy. Ken sold the Holland tix for a nice profit & we kept the other 2 games. The 2 games were in Zurich and we planned around that. Day 1 – LA to Dusseldorf: Joe & I left LAX on our direct flight to Dusseldorf and got in 1st thing the next morning. We had to jump on a train for the 90 minute ride to Koln. We got in & checked into our hotel, the Hotel Dom, right at the foot of the famous Dom church in the Altstadt. I knew from my World Cup trip we would like Koln & this spot plus we were flying the next day from Koln airport. Joe & I cruised the old town which was not as hopping like it was back in ’06…so we headed into the leafier suburb for some hipper sights. We found a cool spot that opened up huge windows to the street & chilled, ate, drank, socialized. Day 2 – Fly to Switzerland: With a flight at the crack of dawn we were up before the sun & out the door for quick train ride to the airport…then a short flight to Zurich, Switzerland. We got in, grabbed our rental car, a French Renault, and hit the road for a 45-minute drive to Lucerne which is a gorgeous town on a lake. We walked around a bit & grabbed something to eat but were exhausted after our travels. So a good afternoon nap & then we were up to go watch the 1st game of the tournament…the hosts Switzerland vs Czech Republic. Of course everyone was buzzing and we found a great spot outside right on the lake that had huge TVs set up. 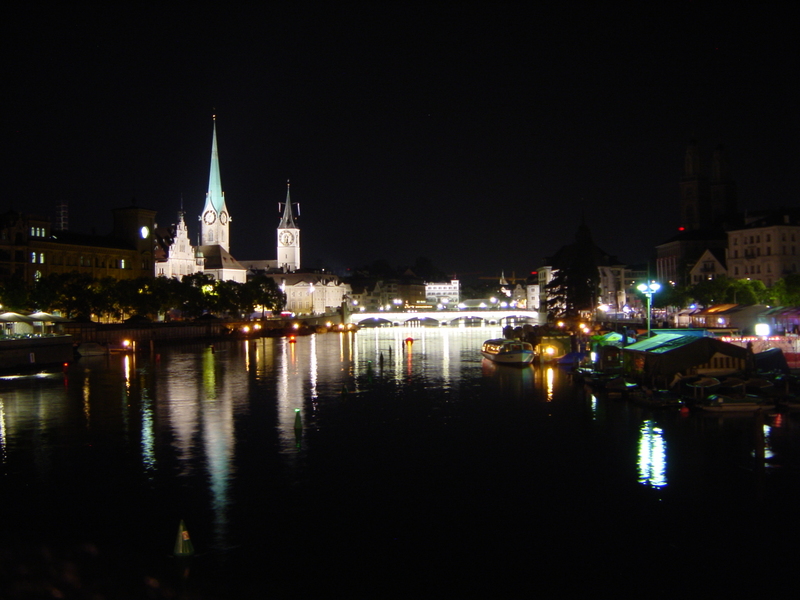 Then we had pick up Ken from the train station & that night we hung out in the dive bar downstairs with a bunch of Swiss locals…then moved next door to a nicer spot later. Day 3 – drive to Munich: Since Joe would not let us do this trip without somehow getting to Munich, we set out the next morning for 5+ hour drive through the stunning Swiss Alps. Along the way I noticed we would be along the Rhine river next to Liechtenstein…so of course we crossed the bridge, took some pics & drove the the capital & largest town, Vaduz. Liechtenstein is a tiny principality & population of only 35,000. The drive thru town took 2 minutes and we jumped back across the river & continued north. On the drive we were suddenly told to pull over by a cop on the road at a sort of turnstile…we pulled out, he came to the window & talked German to Joe who was driving. Since Joe lived in Germany as a kid he has a good mastery of the language…but not quite good enough in this case. We were told we did not have a certain pass on our car that we needed and there was a fine…so we ended up giving him something like 100 euros cash & were on our way. We had no idea what the pass was & we didnt even know which country we were in as we were to cross a small corner of NW Austria. We finally got to his teachers house & she helped us figure out it was in Austria & there was a sign that said to pull off & get the pass. She & her friend welcomed us with a mini keg of German bier & plenty of food. They didnt speak much English so Joe had to be interpreter the whole night. We watched Germany beat Poland 2-0. Before we crashed for the night we welcomed a special friend, the Sea Otter (inside joke for Joe & Ken) who made us laugh for an hour before we could fall asleep. Day 4 – Romania vs France: We woke, had breakfast & hit the road for another 5+ hr drive back to Zurich. Ken took the wheel & had to constantly be reminded by Joe from the backseat to get out of the fast lane…often calling him “ugly American” which always brought laughs. There they know how to drive…most of the autobahn is only 2 and sometimes 3 lanes so they are taught to stay to the right. When you pass you do it and then get back over because there is always someone coming up from behind…and usually quickly. I learned the informal hierarchy there goes: Porsche, Mercedez, BMW, Audi then VW…we were in a French car, no juice & no respect. We saw the sign for the Austrian pass this time but the ticket gave us a couple day leniency plus the cops werent there this time…then on our cross into Switzerland we were told to pull off and buy a Swiss pass, which was weird cuz thats where the rental car originated (later we told the rental co when we returned the car & the guy showed us the pass that was stuck to the front window in front of the rearview mirror…stupid Swiss cop…but they refunded us the pass price). But we obliged & continued on into Zurich, found our place & checked in. 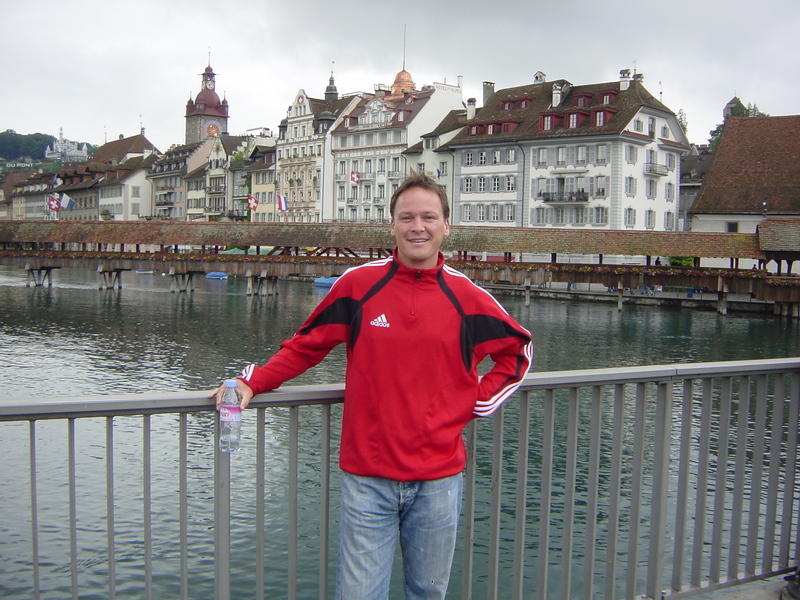 We had a modern 1-bedroom apartment right downtown a few blocks from the river & Lake Zurich. We took the city tram to the stadium & then walked the last few blocks to take in the atmosphere. Inside we found a packed house & plenty of atmosphere with both the French fans & Romanian fans in full voice. 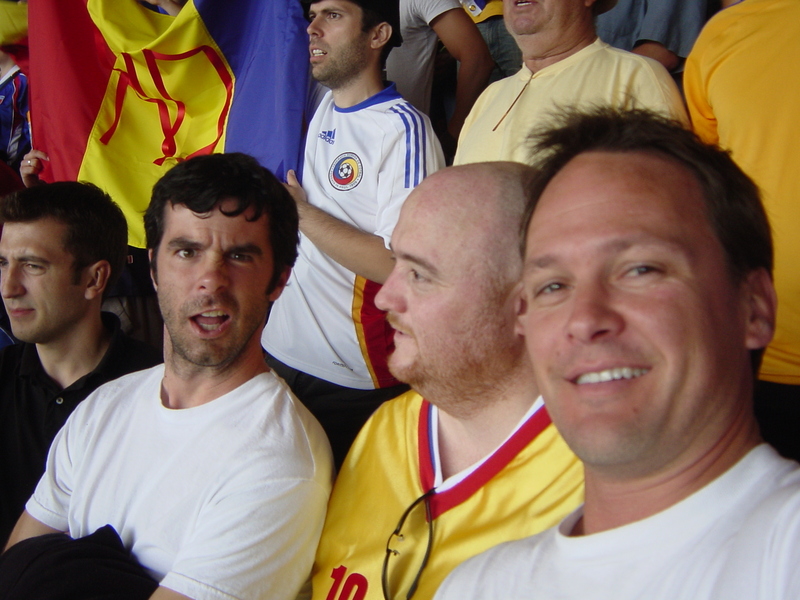 We rooted hard for Romania but it ended 0-0. After the game we headed for the Fan Fest which was set up right on the lake, a great setting for watching the night games, mingling & people-watching. Day 5 – fly to Spain: Again we were up early to fly to Alicante, Spain with a quick stop in Mallorca which is an island in the Mediterranean. We had a hookup for a free condo for 3 nights from one of Ken’s friends. He got his English buddy to pick us up at the airport so we jumped in and headed for town. We left the airport & headed towards the water…all of a sudden we turned right, which was wrong cuz we could see the city of Alicante to the left & Joe had been there before. We continued driving for about 20 mins & as Joe & I looked at each other in wonderment in the backseat he asked how much further…”not far now” was the response. Well 20 mins later we were in the town of Torrevieja, a small, condo-filled town of British expats. As we were exhausted we settled on crashing there for the night & then going in to get a place in Alicante the next day. Richard came in that evening to join us & we hung out at the local sangria bar watching games. Day 6 – move to Alicante: I woke up 1st and went for a nice run down to the water & down the strand along the Med/beach. Later the same guy drove us all into town, we jumped out & walked a block before we found a decent hostel/hotel & grabbed 3 rooms (Joe & I shared). Again we hung out, drank sangria & watched games that night. Day 7 – Alicante: Today was a beach day & we found a good spot & relaxed in & out of the water. 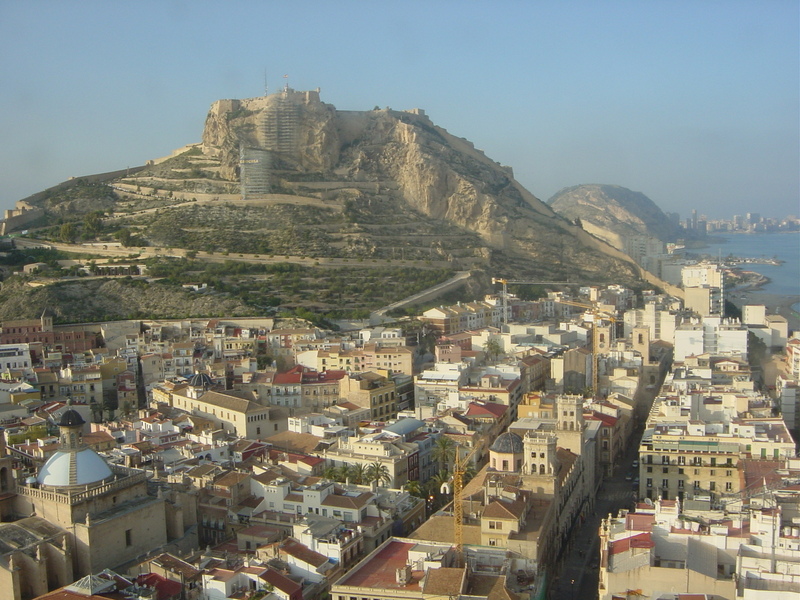 Alicante has a huge castle, the Castilon de Santa Barbara, that sits atop a mountain overlooking the city & the water and dates back to the 8th century…so we got some good pics of that & then Joe & I ran up to the top that afternoon. That evening we found the hip little walk-street with a bunch of cafes & bars & found a spot to chill with our sangria & people watch. Day 8 – back to Switzerland: Another travel day after at least getting to chill for 2 nites in the same place and we were up before dawn for Joe & I to fly to Zurich and for Ken & Richard to train to Barcelona. 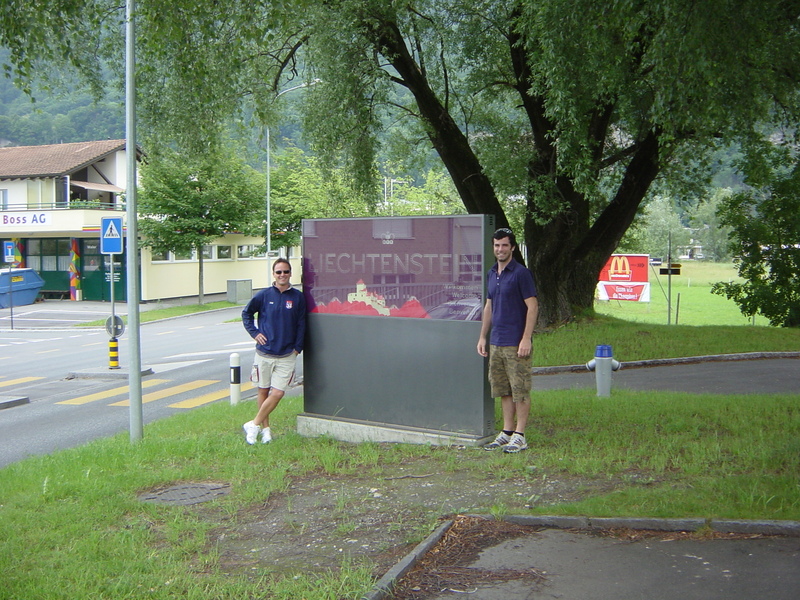 McG and I got into Zurich early that morning and didnt have anything to do until our 8pm Romania/Italy game…so I came up with the plan to train immediately to Basel (1 hour away) because thats where we were flying out of the next day & had a hotel reservation. We got to the hotel & they let us check in and we crashed for quite a few hours. 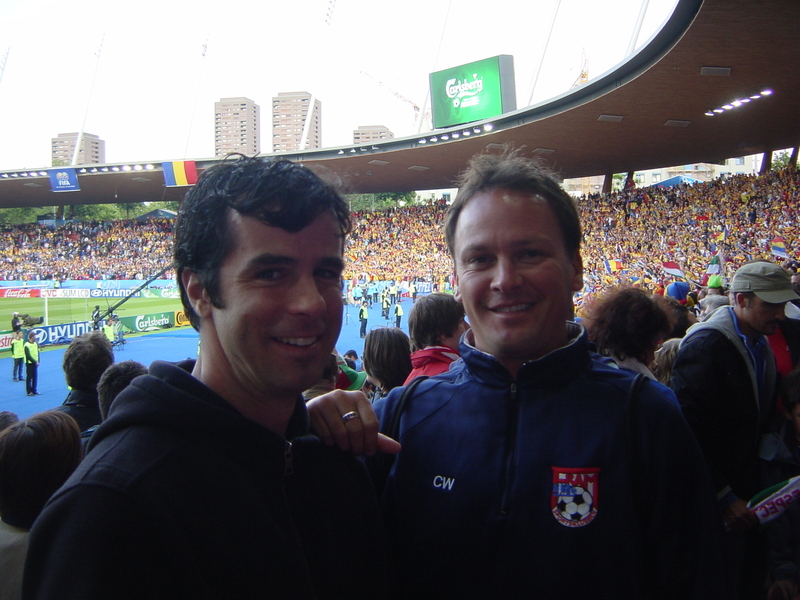 We got up & jumped on the train back to Zurich for the game (best part of this overall plan was that our train travel was free that day because we had a game ticket)…Romania tied Italy 1-1. Joey wanted to hang at the Zurich Fan Fest as long as possible so we did til about midnight and caught the last train to Basel. Day 9 – fly to Amsterdam: Travel day again but not too early so I got up and did a quick walk thru the Altstadt of Basel which sits on the Rhine river by the border of France & Germany and the airport is actually in France. Short flight to Amsterdam so we got there in the early afternoon & trained into town & walked to our apartment in the Haarlem area…which some may think of Harlem, NY…they are not alike…this is a nice neighborhood just out of the very city-center, surrounded by the canals. Our apartment was sick…big 2-level, 3-bedroom place on the corner above a bar/restaurant. Ken & Richard caught up to us from their flight in from Barcelona and we all took it easy that night with just a stroll around the city. Day 10 – Amsterdam festival: Amsterdam is a compact city where EVERYONE rides bikes & its perfect for it with plenty of bike lanes. So we got up & rented our bikes & rode around town. 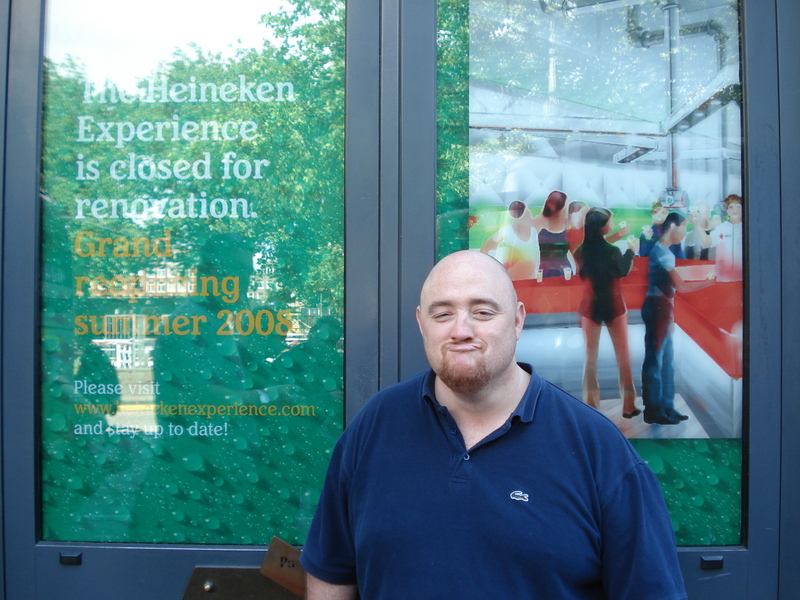 All Ken had talked about for years was the Heineken museum…and 2 years prior they had made a side trip from Germany to Amsterdam & it was closed for some reason…now 2 years later he couldnt wait. We rode to it, walked up & read the sign…closed for renovations for a while. Ken had to wait again. So Joe really wanted to hit a music festival in the suburbs so we agreed & took a nice 12-15 mile ride out, stopping at a few pubs along the way. We chilled there for a while & rode back at dusk. 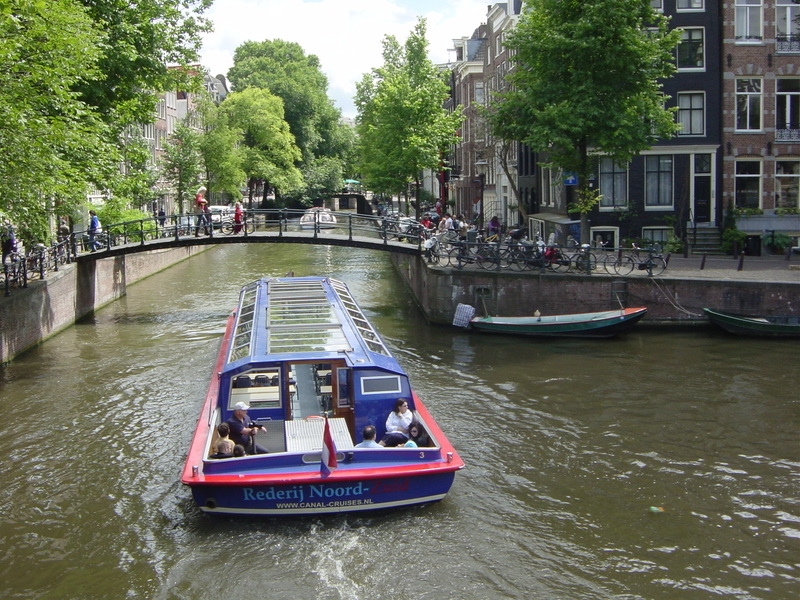 Day 11 – Amsterdam sights: We all hit the road on our bikes that day and toured the city…Joe & I ended up going a separate way & did a canal boat cruise which is essential. The other guys hit a museum & a different cruise. That night we went out to watch games & enjoy the nightlife. Day 12 – to Brussels: Richard split off today to head home while the other 3 of us caught a train to Brussels, Belgium. A couple hours later we were there & got into our rented 2 bedroom apartment in the ‘burbs. We trained into the city & met my old German friend Achim, who still lived in Brussels, at the big central square. We had dinner & drinks at an outdoor cafe in a cool little section of town and watched Italy win & all the crazy Italian fans drive around & celebrate. 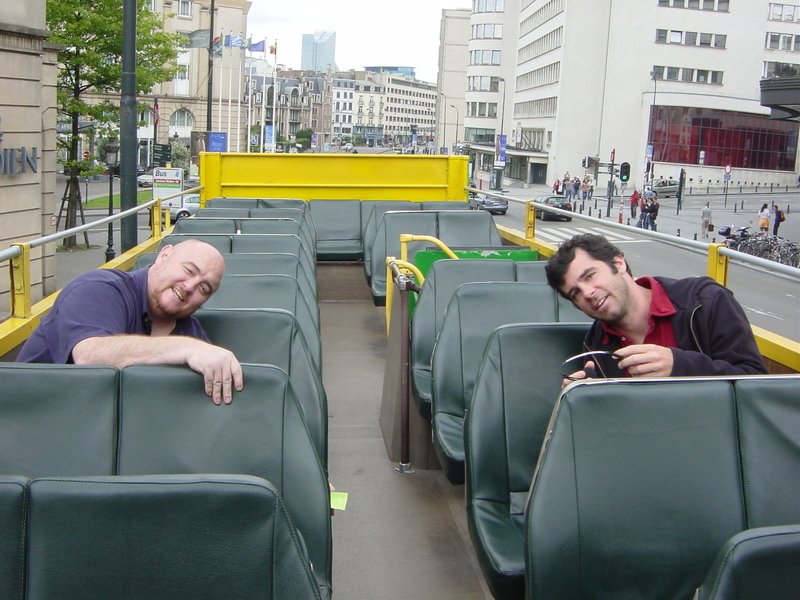 Day 13 – Brussels tour: Our last full day in Europe…we decided to take the double-decker bus tour of the city. Nice trip around town & caught all the major sights. We finished the day back at the outdoor cafes enjoying some of the numerous Belgian beers…they make more beer than any other country. 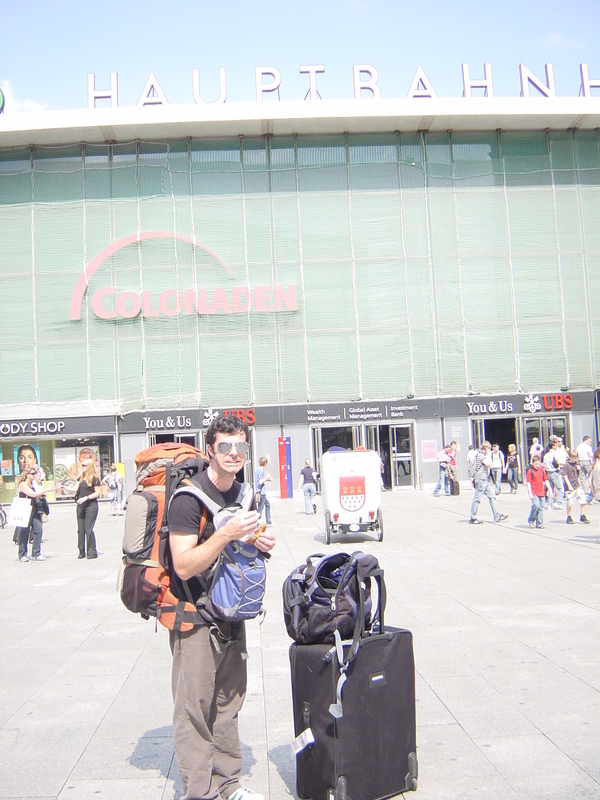 Day 14 – homeward: Joe & I caught a train back to Dusseldorf to fly back to LA…Kenny went on a further journey in Europe. Another fantastic trip in the books…but it was exhausting. For those counting that was 9 countries in 14 days with many 1-nite stops. The next Euro championships are in 2012 hosted by Ukraine/Poland…its definitely in my sights.